Ford introduced all-new models for 1952, beating rival Chevrolet to the punch by a full year. The Customline became the company's mid-market entry, and it featured a more modern style. Wraparound windshield, curved rear glass, a modified grille, and more ornamentation to break up the earlier "Shoebox" Ford's slab sides gave the new Customline a fresh look. The Customline came standard with an overhead-valve six-cylinder that displaced 215 cid and made 101 hp. An optional 239-cid L-head engine using a two-barrel carburetor was available, with this choice lending 110 hp to the driver. A three-speed manual transmission was standard, while overdrive and Ford-O-Matic were optional with either motor. Body styles included a club coupe, Tudor and Fordor sedans, and a four-door Country Sedan station wagon. The base price for a Customline in 1952 was in the neighborhood of $1,700. The 1953 Ford Customline was largely the same as the previous year, with a slightly simpler grille and different brightwork on the car’s side. Body choices and prices were essentially the same, as were powertrain choices. Power steering became a welcome option this model year. The 1954 model received a new suspension setup and a new engine tunes. The standard six-cylinder now produced 115 hp, while the optional V-8 now had 130 hp on tap. New luxury options included power brakes, windows, and front seat, and a two-door Ranch station wagon also joined the Customline lineup this year. The 1955 Ford Customline was radically different from the 1954 model. The grille was markedly different, as it no longer sported a spinner front. An arced and creased trim piece ran from the A-pillar to the rear of the car The Customline club coupe was dropped, while an eight-passenger station wagon was added. Price were now in excess of $1,800. The 1956 Customline's major development was the introduction of a 12-volt electrical system. The car also received more of the Thunderbird’s styling, and air conditioning became optional. The optional V-8 became the 173-hp, 272-cid unit, though the station wagon’s V-8 choice was the 292-cid, 200-hp engine that was standard in the Thunderbird. 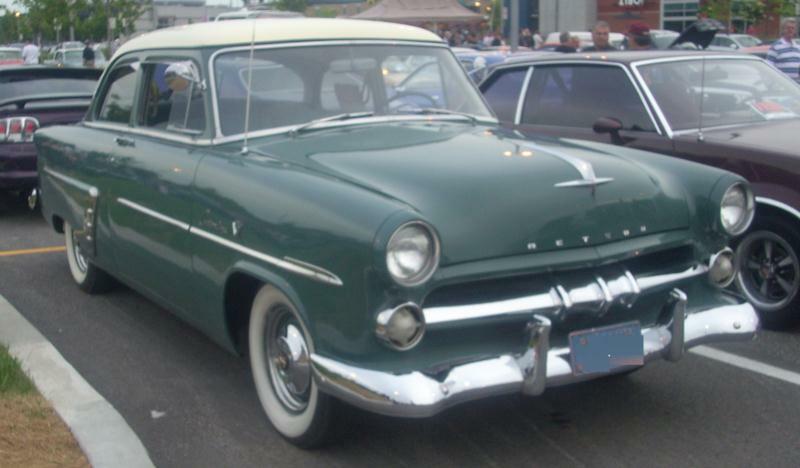 The Ford Customline was extremely popular, with nearly three million leaving assembly lines. Collectors usually seek out the 1956 models due to their 12-volt systems and the power options they can support. Earlier cars are interesting and affordable options as well. Any Customline is relatively easy to maintain assuming rust and rot are kept in check. All in all, the car is an affordable way to experience a mainstream 1950s American car. Click here to read Hemmings Motor News' Buyers Guide for the 1955-1956 Full Size Ford.